Defender Peter Murphy scored two late goals to send last season's beaten finalists Carlisle closer to a Wembley return as they saw off Crewe. Clayton Donaldson put into his own net early on from Matty Robson's cross. And after both sides hit the woodwork, Murphy made it two for Carlisle by heading in James Berrett's corner. Donaldson redeemed himself by firing in a powerful effort but a second Murphy header wrapped up this Johnstone's Paint Trophy area quarter-final. 90:00+2:21 The match has reached full-time. 90:00+0:31 Free kick awarded for an unfair challenge on Tom Taiwo by Clayton Donaldson. Direct free kick taken by Ben Marshall. 88:54 The ball is crossed by Francois Zoko, clearance by Adam Dugdale. Inswinging corner taken right-footed by James Berrett from the left by-line, save by Rhys Taylor. Francois Zoko takes a shot. Danny Blanchett gets a block in. Outswinging corner taken from the left by-line by James Berrett. 87:27 A cross is delivered by Matt Tootle. 86:55 Frank Simek delivers the ball. 84:38 The ball is crossed by Ben Marshall, Corner taken right-footed by James Berrett from the left by-line, assist on the goal came from James Berrett. Rhys Taylor makes a save. 84:38 GOAL - Peter Murphy:Carlisle 3 - 1 Crewe Peter Murphy scores a headed goal from inside the six-yard box. 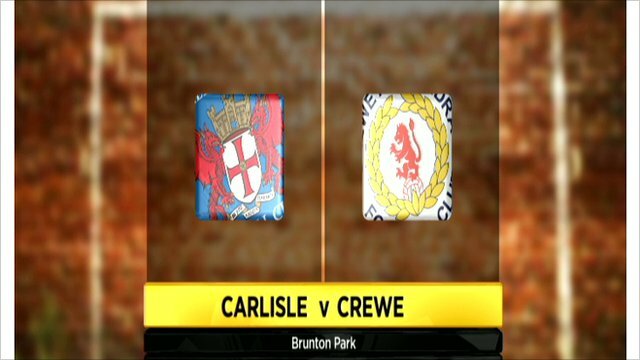 Carlisle 3-1 Crewe. 82:17 Outswinging corner taken by Ashley Westwood from the right by-line. 80:54 The official flags Gary Madine offside. Direct free kick taken by Rhys Taylor. 80:54 Substitution (Carlisle) makes a substitution, with Craig Curran coming on for Gary Madine. 80:54 Booking The referee shows Tom Taiwo a yellow card for unsporting behaviour. 75:07 The assist for the goal came from Byron Moore. 75:07 GOAL - Clayton Donaldson:Carlisle 2 - 1 Crewe Goal scored by Clayton Donaldson from deep inside the penalty box to the bottom left corner of the goal. Carlisle 2-1 Crewe. Correction - 71:55 Inswinging corner taken right-footed by James Berrett, assist on the goal came from James Berrett. Correction - 71:55 Substitution (Crewe) makes a substitution, with Lee Bell coming on for Nick Powell. 71:55 James Berrett takes the inswinging corner, the assist for the goal came from James Berrett. 71:55 Substitution Nick Powell leaves the field to be replaced by Lee Bell. 71:55 GOAL - Peter Murphy:Carlisle 2 - 0 Crewe Peter Murphy finds the net with a goal from close range to the top left corner of the goal. Carlisle 2-0 Crewe. Correction - 71:19 Substitution James Chester on for Lubomir Michalik. 71:19 Substitution James Chester on for Lubomir Michalik. 69:57 Outswinging corner taken by James Berrett, Gary Madine takes a shot. Clearance by Matt Tootle. 69:51 Frank Simek produces a cross, Byron Moore makes a clearance. 68:27 Patrick Ada gives away a free kick for an unfair challenge on Matthew Robson. Adam Collin restarts play with the free kick. 67:54 Outswinging corner taken by Ashley Westwood from the right by-line, clearance made by Peter Murphy. 65:30 Substitution Francois Zoko on for Mike Grella. 64:42 Nick Powell has an effort at goal. Save by Adam Collin. 63:19 Adam Dugdale concedes a free kick for a foul on James Berrett. Thomas Cruise takes the direct free kick. 63:19 Booking Adam Dugdale goes into the referee's book for unsporting behaviour. 59:50 Mike Grella takes a shot. Shot by Ben Marshall. Adam Dugdale gets a block in. Corner taken by James Berrett from the right by-line. 58:43 The assistant referee flags for offside against Mike Grella. Rhys Taylor restarts play with the free kick. 58:18 Peter Murphy sends in a cross, Ashley Westwood manages to make a clearance. 57:19 Corner taken right-footed by James Berrett to the near post, clearance made by Clayton Donaldson. 57:14 The ball is delivered by Thomas Cruise, Matt Tootle manages to make a clearance. 55:32 Free kick awarded for a foul by Mike Grella on Byron Moore. Free kick taken by Ashley Westwood. 55:06 The ball is delivered by Byron Moore, clearance made by Peter Murphy. Byron Moore takes a short corner. Correction - 52:35 Clayton Donaldson challenges Thomas Cruise unfairly and gives away a free kick. Direct free kick taken by Thomas Cruise. 52:35 Clayton Donaldson challenges Thomas Cruise unfairly and gives away a free kick. Thomas Cruise takes the direct free kick. 51:19 Corner taken right-footed by Ashley Westwood. 50:19 Corner taken right-footed by Ashley Westwood from the right by-line, Lubomir Michalik manages to make a clearance. 49:46 The referee blows for offside. Adam Collin takes the free kick. 47:48 Handball by Ajay Leitch-Smith. Adam Collin restarts play with the free kick. 46:08 Nick Powell gives away a free kick for an unfair challenge on James Berrett. Peter Murphy takes the free kick. Shot on goal by Frank Simek from just inside the area goes over the target. 45:00+1:40 The whistle is blown to end the first half. 45:00+0:48 The ball is sent over by Peter Murphy, save by Rhys Taylor. Unfair challenge on Ajay Leitch-Smith by Lubomir Michalik results in a free kick. The free kick is delivered left-footed by Ashley Westwood from left wing. 43:52 Effort from inside the area by Peter Murphy misses to the left of the goal. Correction - 43:01 The ball is sent over by Matthew Robson, Effort on goal by Gary Madine from inside the penalty area goes harmlessly over the bar. 43:01 Matthew Robson produces a cross, Shot on goal by Gary Madine from inside the box goes harmlessly over the target. 41:21 Nick Powell takes a shot. Save by Adam Collin. Correction - 39:30 Tom Taiwo challenges Danny Blanchett unfairly and gives away a free kick. Ashley Westwood takes the free kick. 39:30 Byron Moore fouled by Tom Taiwo, the ref awards a free kick. Ashley Westwood takes the direct free kick. 38:52 The ball is swung over by Ben Marshall. 37:26 Unfair challenge on Gary Madine by Patrick Ada results in a free kick. The ball is swung over by Thomas Cruise, Ben Marshall takes a shot. Save by Rhys Taylor. Clayton Donaldson takes a shot. Comfortable save by Adam Collin. 34:35 Effort from deep inside the area by Clayton Donaldson misses to the left of the target. 33:36 Unfair challenge on Clayton Donaldson by Matthew Robson results in a free kick. Rhys Taylor restarts play with the free kick. 30:18 Corner taken by James Berrett, save by Rhys Taylor. 30:10 Frank Simek sends in a cross, clearance made by Matt Tootle. 29:59 Luke Murphy sends in a cross, save made by Adam Collin. 28:25 Nick Powell has an effort at goal from outside the box which goes wide right of the target. 26:00 Danny Blanchett delivers the ball, save by Adam Collin. 22:54 Tom Taiwo produces a right-footed shot from outside the penalty box and misses wide left of the target. 22:48 The ball is sent over by James Berrett, clearance by Matt Tootle. 21:49 Thomas Cruise sends in a cross, Danny Blanchett manages to make a clearance. 19:40 The ball is sent over by Thomas Cruise, Header by Gary Madine from deep inside the penalty area misses to the left of the target. 18:08 Gary Madine takes a shot. Adam Dugdale gets a block in. Inswinging corner taken by James Berrett, free kick awarded for a foul by Gary Madine on Rhys Taylor. Rhys Taylor takes the free kick. 16:44 Frank Simek fouled by Patrick Ada, the ref awards a free kick. Thomas Cruise takes the free kick. 14:43 Thomas Cruise has an effort at goal from 20 yards. Save by Rhys Taylor. 13:02 GOAL - Clayton Donaldson:Carlisle 1 - 0 Crewe Clayton Donaldson scores an own goal from 6 yards. Carlisle 1-0 Crewe. 12:35 Free kick awarded for a foul by Ajay Leitch-Smith on Frank Simek. Matthew Robson takes the free kick. 8:08 Outswinging corner taken by James Berrett from the right by-line, Gary Madine takes a shot. Save made by Rhys Taylor. 5:32 Lubomir Michalik gives away a free kick for an unfair challenge on Ajay Leitch-Smith. Free kick taken by Danny Blanchett. 4:00 James Berrett takes the outswinging corner, Adam Dugdale manages to make a clearance. 3:52 The ball is delivered by Matthew Robson, clearance by Danny Blanchett. 3:17 Outswinging corner taken right-footed by James Berrett from the right by-line. 2:48 The ball is crossed by Matthew Robson, clearance made by Adam Dugdale. Inswinging corner taken from the left by-line by James Berrett, Patrick Ada manages to make a clearance. 2:07 Clayton Donaldson takes a shot. Adam Collin makes a comfortable save. 1:57 A cross is delivered by Clayton Donaldson, clearance made by Lubomir Michalik. 0:42 Centre by Matthew Robson.